We changed our minds. Forget sunny & balmy, it’s cold! Now we want IN! A couple of months ago I moved the pregnant Ladies to the newly fenced front pasture where they could enjoy the last of the not yet grazed grass. Lucky for us, every one of the pastures has both high and low land so each pasture has plenty of well-drained high ground for the wet messy times when the creeks are overflowing. Which apparently these days can be anytime, all year-long. 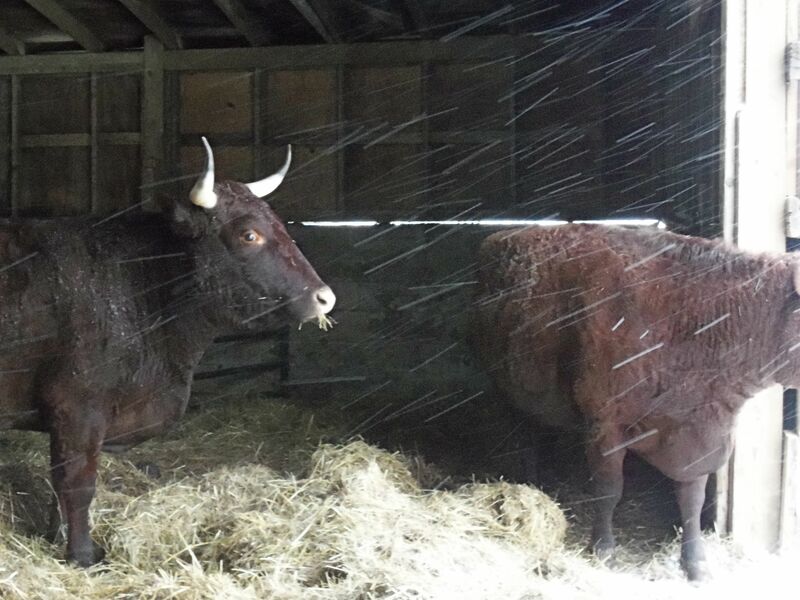 While our winter weather remained so balmy and mild, the Ladies had little interest in the adjoining barn other than the usual cow-riosity. Did you know how nosy cows are? 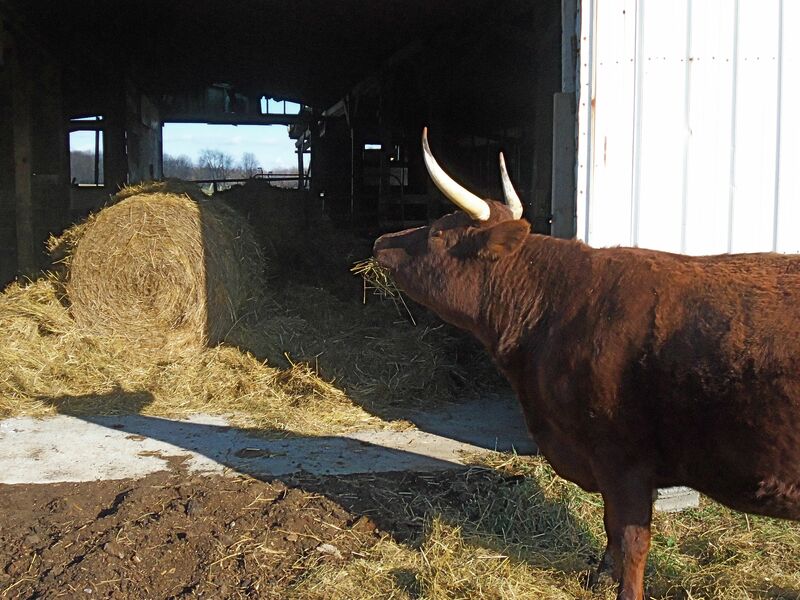 Neither did I, but let me tell you, cats have nothing on cows when it comes to curiosity. 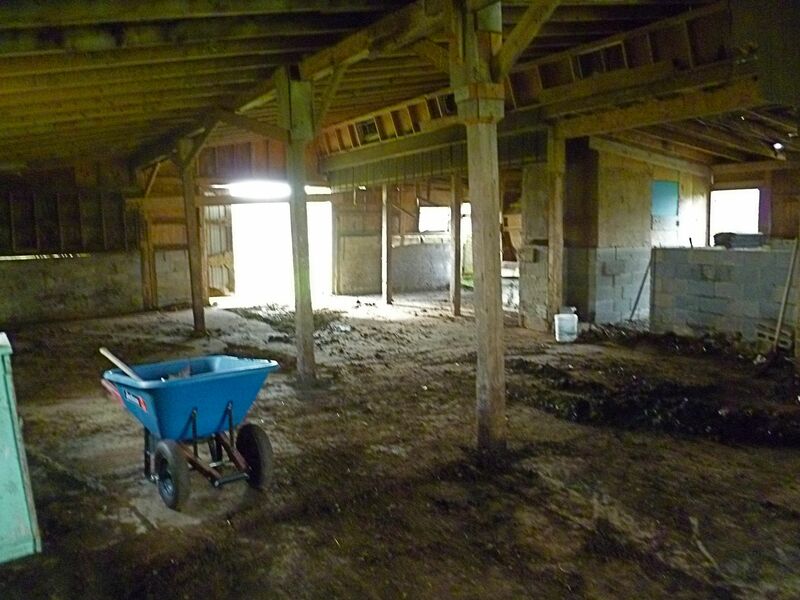 All summer, we have been slowly working on the barn. I didn’t really give this building much credit or thought at first. 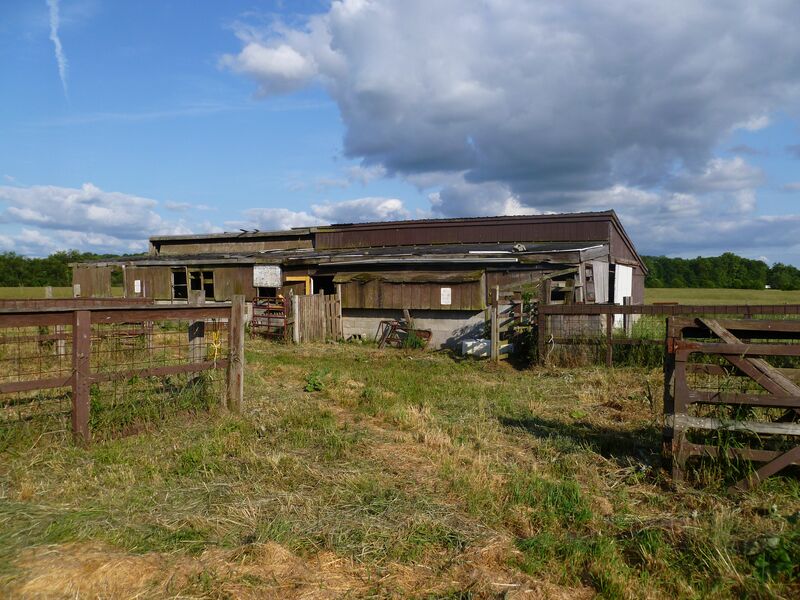 No architectural beauty, it was rough & ready with a floor piled high with black, rich composted manure from years of cows sheltering inside. 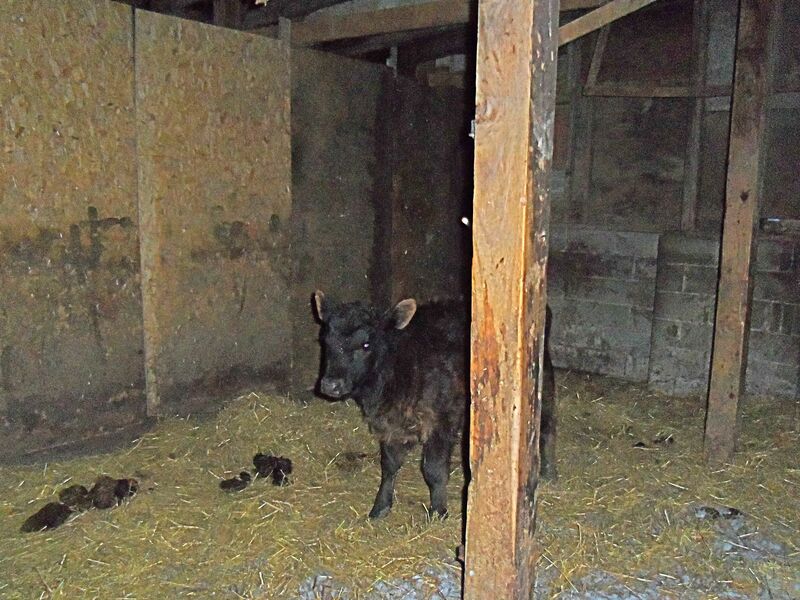 But, the beams were solid, half had a new roof and it adjoins the front pasture and hayfield in a convenient way. Not having the budget for anything better, we were grateful to have it, warts and all. 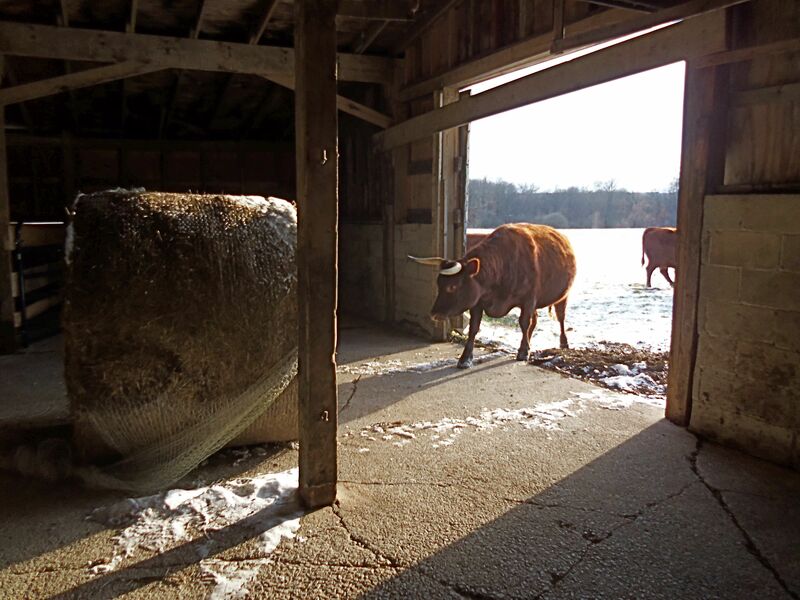 We tarped the roof to keep the leaks at bay, cleaned out all the old lumber and partitions, and shoveled out the foot of manure and spread it on the garden to be. Amazingly, the entire floor was poured concrete! 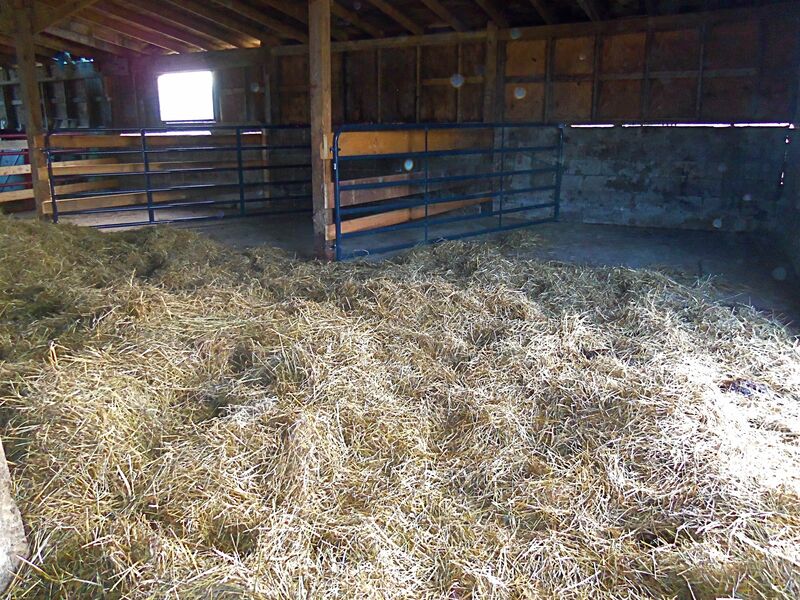 We built partitions and hung gates to create a couple of private stalls for calving and I brought fresh hay in for bedding. I had been counting on Bling’s help to shake out the hay – shaking a thousand pound round bale into a fluffy bed is no easy task, and Bling has a real talent for the job. xxxxxx Bling looked…….. xxxxxxxxxxxxxxxxxxxxx and looked….. The Ladies were somewhat interested in the activity – they like to watch people work – but the warm days and what’s left of the fresh grass kept them busy outside. No help, no bites. A few curious sniffs, a couple of gatherings in front, but nobody seems interested in taking up residence. Well, oh my, what a difference a day makes! Dropped temperatures, harsh winds and snow is making this humble structure look like the Taj Mahal! Even wild Miss Sass decided inside is the place to be! Can’t judge a book by its cover – this week, this is the most beautiful barn I’ve ever seen! And I can sleep knowing the Ladies are dry and warm. Looks fantastic!!! Too bad there’s no ‘before’ photos. Free room and board…who could ask for anything more! Doesn’t it? Thanks so much for all your help. The Ladies are settling right in.